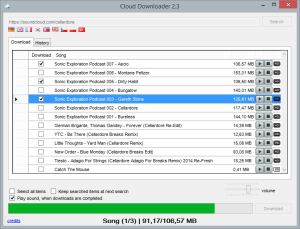 Just yesterday I had released the version 2.6.5 of the Cloud Downloader, because the downloader was broken by changes to the SoundCloud website. Unfortunately, I realized that the 2.6.5er update did not fix all errors and so that some links were still not working. Therefor, just one day after the last release, I’ll present you another version of the Cloud Downloaders today. Version 2.7 fixes a few bugs ceoncerning the search function of the downloader. In addition, the new version brings an improvement in the update window, that unfortunately displays from time to time outdated links. With the next update (the next time you’ll see the update window), this issue should be disappeared. The new version 2.7 of the Cloud Downloader can be found as usual in the main article about the tool or via the link below. Today there is again a small update for the Cloud Downloader. However, the new version is only an interim release with bugfixes. New features are waiting for you in the next release of the Cloud Downloader. However, since there were changes to the SoundCloud website and the current version 2.6 has thus lost its function, I had to bring forward this release. The latest version for now is 2.6.5, which can be found, as usual, in the main article about Cloud Downloader. Please follow the link below to download the new version. In September I brought out the last cloud downloader update. Now today I’ll release the next version for you. With the last update there have been some changes to the download logic in order to respond to the changes on the SoundCloud website. Unfortunately, my algorithm was not 100% bullet-proof, so in playlists only the first 10 songs have been displayed. In addition to that SoundCloud began to stream some songs exclusively as rtmp stream, so I had to rework the download logic another time. I look forward to your feedback and hope you enjoy the new downloader. This is the home of the “Cloud Downloader” (formerly known as Soundcloud Downloader”). Here you will find the downloadlink, can write me comments and feature wishes, say thank you and maybe, if you really like the software, send me some bucks. For all those who do not know the Cloud Downloader, I have included a short video below this paragraph. If you don’t like videos – no problem – the idea behinde the Cloud Downloader is explained in a few words. You start the Cloud Downloader, add a link which points to any songpage on soundcloud.com and click on the search-button. 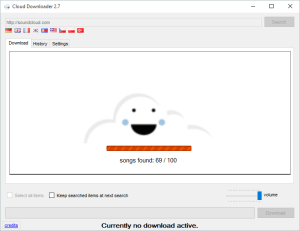 After that the Downloader shows you all available songs and you can choose if you like to listen to them or download them with another click, without any fuss.